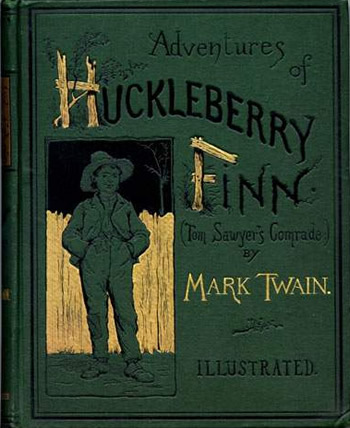 What do the scheduled publication of a sanitized version of Mark Twain's classic The Adventures of Huckleberry Finn, by the independent publishing house located in Montgomery, Alabama, New South Books, and the French Minister of Culture and Communication's decision to remove Louis-Ferdinand Destouches's name from a list of other French worthies to be included in this year's Célébrations Nationales have in common? I realize that's a long sentence, but the answer is succinct: much more than you might expect. Both events will occur in 2011 and in each case an individual, or relatively small group of individuals, is responding to the demands of another group, usually a minority (by which I mean merely that they don't necessarily represent in any way a majority of their respective populations), and this individual or group of individuals is-with the metaphoric stroke of a pen-rewriting, or rather recasting, a part of our common heritage. In France, Louis-Ferdinand Destouches, better known as Céline, the controversial author of the internationally acclaimed literary masterpiece, Journey to the End of the Night , among other writings, was originally included in the list of French citizens to be honorably mentioned and their achievements recognized during national celebrations designed (in 1979) to commemorate "important national historic events" and people. But in response to a petition from Serge Klarsfeld (president of the association of Sons and Daughters of Jewish Deportees from France), the French Minister of Culture, Frédéric Mitterrand, decided to remove Céline's name from the list. Although it is understandable in each case that some people-and not only black Americans and French Jews-should object to either Mark Twain's use of the 'N-word' (a clumsy euphemism which probably does as much damage, at least to our intellects, as the original slur) or Céline (who was a renowned and unrepentant anti-Semite) being honored in any way, this purportedly right-minded self-censorship only further entrenches and impedes, instead of helping us to collectively accept and resolve, some of the more unsavory aspects of our human nature. Mate suggests what should be obvious: if we erase from our history everything we don't like in it, everything that makes us uncomfortable now, we run the risk of leaving no trace of that which was wrong, no reminder of our failures, and hence we can't possibly learn from the past and will therefore be more likely to make the same or similar mistakes in the future. Unfortunately racism and bigotry do form part of our human and communal natures. This can't possibly be denied, can it? Whether such undesirable traits are contained within our DNA or not, or whether these moral aberrations are the consequence of learned and imbibed behavior, is an open question that may never be answered. But we don't get rid of these things by refusing to see them. The horrific facts of hundreds if not thousands of years of slavery, recurrent ethnic and religious genocides, all of it culminating in the Nazi Holocaust-none of this can be obliterated from the reality of our historical experience. It can only, and this but possibly, be erased from the historical record, and then perhaps forgotten. But anyone with any sensitivity towards this suffering dreads precisely this forgetting, because they know what such collective amnesia can lead to. A basic psychological premise is that which states that whatever we cannot, or refuse, to see in ourselves can never be corrected. If someone has a problem with alcohol, if someone is an alcoholic, the first step towards liberating themselves from that addiction is the recognition of their dependency, as well as the gravity of the problem. This is never accomplished by camouflaging the symptoms. But in almost every case it is accompanied by a great deal of denial on the part of the alcoholic. Manuel-Reyes Mate has thought seriously and profoundly about the tragedies of the Spanish Civil War and the Nazi Holocaust in particular, and in his opinion we would better serve future generations-who will have so little contact in their daily lives with anything that might remotely remind them of that which their forebears endured-if, instead of removing all the monuments that someone like Franco erected to himself (and his merciless and uncompromising victory over his political enemies)-including the Valle de los Caídos , where some people want to take down the 150-meter-high cross-we sought to explain them. How can a teenager in the States, whether he or she is white, black, yellow or green, understand anything about the country and its (at least partial) economic dependence upon a system of slavery until a bloody civil war was fought over this and other issues, if we so dilute every single piece of evidence testifying to the grim reality of that system until it becomes sterile and innocuous in their fertile minds? Granted, we don't want young black or 'half-blood' children to feel stigmatized and denigrated by the noncritical use of a historically determined racial slur, but how can we make a real dent in the underlying racial divisions that still operate in the nation without first being honest about the issue, without not only recognizing how much progress has been made, but how much more remains to be done? We now live in a world of ever growing access to almost unlimited texts and images. We cannot hope to filter and successfully censor that which we would prefer did not exist. We cannot 'protect' the minds of our children in this way. But we can help them to understand by explaining to them what we know, and possibly remember, by indicating to them how much things have changed, and often for the better. Ultimately the only defense against the racial prejudices that Mark Twain portrayed in his fiction, and the rabid anti-Semitism that the literary genius Céline expressed in his pamphlets, is a more thoroughly ingrained and widely-shared attitude of tolerance on the part of the world's youth. But they can only learn tolerance and understand what it means and value it for themselves if they are allowed to know about the intolerance that has characterized so much of human history. And this can be most effectively accomplished if they are exposed to the historically accurate yet often politically incorrect testimony, and the sometimes lethal consequences of intolerance that this testimony faithfully records. 1 Qué hacemos con los genios infames?